Sheldon Statewide is an annual exhibition and outreach program through which original artworks from the museum's collection travel to communities across the state. Since its inception in 1987, the exhibition series has reached 330,000 people in twenty-four Nebraska communities. Sheldon Statewide is made possible by the generous support of the Farmers Mutual Insurance of Nebraska, Rhonda Seacrest, Nebraska Arts Council and Nebraska Cultural Endowment, and the Sheldon Art Association. 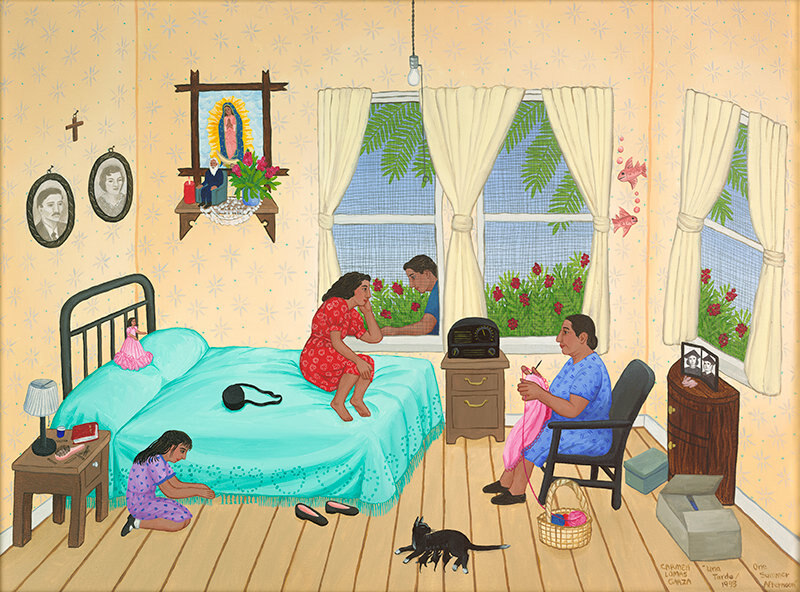 Carmen Lomas Garza (born Kingsville, TX 1948). Una Tarde / One Summer Afternoon, 1993. Alkyd on canvas; 23 3/8 × 31 1/2 inches. Sheldon Museum of Art, University of Nebraska–Lincoln, Robert E. Schweser and Fern Beardsley Schweser Acquisition Fund, through the University of Nebraska Foundation, U–5741.2012. The thirty-second annual Sheldon Statewide exhibition, Family Style, investigates the meaning of “family” through the work of eighteen artists. The objects in this exhibition offer a range of perspectives on family and relationships, from tight-knit to distant, from intimate to communal. Some families are given and some are chosen. Exploring different kinds of families helps us see beyond our own experiences and consider those of others. Together, the artworks demonstrate that families of all types work through the events and routines of everyday life with members performing essential functions, providing structure and guidance, and growing in their own ways. Family Style represents a wide—but certainly not exhaustive—range of viewpoints from which artists examine the intricate relationships that make up parenthood, marriage, teamwork, and community. Download the gallery guide for Sheldon Statewide 2018–2019 here. Educator resources for Family Style are available here. For information about Sheldon Statewide, please contact Abby Groth, assistant curator of public programs, at agroth@unl.edu or 402-472-7858.